Students are labeled pesky when they pester their students with questions about their scores in quizzes and exercises. They are viewed as annoying when near the end of a semester or shortly after final exams they send emails to their teachers or call them to inquire about their grades. Teachers say that students are desperate when after seeing their report cards they move heaven and earth to make the former reconsider the grades they have given and possibly give higher marks citing 101 reasons why it must be done. Reasons they give range from queer to valid. How many times have some teachers violated established rules on test and measurement… rolled the correction tape on the grades they have given because they got moved either by appeals from the students or by pressure from the academic gods and goddesses. Students are often criticized for being so grade-conscious. But is it their fault? Students are grade-conscious not because they want to but standards of society force them to be. The policies and procedures in the academe frame that kind of mind-set in the consciousness of students. They are seemingly programmed to become grade-conscious. It all begins at home. Parents keep reminding their children to study hard and get good grades. When the children get to school, the indoctrination goes full steam. 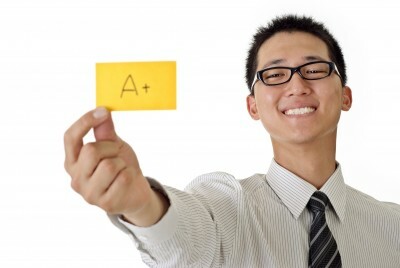 Teachers give a battery of tests and exercises telling the students to perform well if they want to pass the subject. And that if they want to be part of the honor roll then they need to have high scores. Parents tell students to study hard, the teachers tell them to study harder. Day and night students are told that they must get good grades. After school, parents would even acquire the services of a tutor to further improve the academic performance of their children. That’s how the “getting-good-grades-is-a-must” mentality gets ingrained in the consciousness of the poor little kids. Companies and corporations deliver the coup de grace by frequently advertising that they hire only the best and brightest. And what’s the tangible measurement of these superlatives (best and brightest)? GRADES… A+, or 1 or 5 or what-have-you. Society have assigned GRADES as proof of excellence. Academic performance of students is measured through their grades. The higher the grades the more excellent is the student. That’s how it goes. RESULT? The students become grade-conscious. The grades they receive is a microscope and they are the specimen on the slide. Their academic marks are like lenses used to magnify the contents of the shell between their ears. The parents want them to work hard for their grades. Yes, perhaps for the children’s sake but the grades they receive is an instrument used by the parents in monitoring their investment. They want to make sure that their children are not wasting the money they are spending for their education. Parents become so mad when their children present to them unsatisfactory academic marks. And of course, when their children perform well academically, they are elated no end. It is a boost to their pride, a feather in their caps. The schools in any country stretch their students to the limits of academic achievement because when students pass standardized examinations given by their governments it redounds to their benefit. It’s good for ranking and accreditation purposes. It’s a boost to their reputation resulting to more funding from their government and more enrollees flocking to their gates with their parents just more than willing to pay so their children could take a bite at their academic excellence pie. The parents and the teachers keep telling the kids that good grades is a prerequisite to success, the only way to get a good job. Thus the students think that the purpose of education is purely economic, to prepare them for a job. And if they fail to get good marks their future is doomed. They will not succeed. This is the way the students are brainwashed into getting the highest marks possible. This is what developed among students a tunnel vision about education, that it’s all about getting good grades in order to be among the best and the brightest to who the big companies and corporations would give a chance to get a high-paying job. The grades have seemingly become a curse. The grades take joy off learning. They make students prisoners in the classrooms and the teachers the unforgiving and unrelenting prison guards. The grades put blinders on the students preventing them from seeing the bigger picture, that education is more than getting good grades and that its purpose goes beyond getting a job… that education is a preparation for life. It’s sad that both the parents and the educators themselves are the ones putting the blinders on the students. They are the ones who put enormous pressure on the students to get good grades. There’s nothing wrong with inculcating excellence among students. That’s what schools ought to be doing. There’s nothing wrong as well if students are encouraged to get the highest marks possible. But both their teachers and parents must not forget to tell them also that grades are not the be-all and end-all of schooling. The students need to be told that the world doesn’t end if they don’t receive A+ (or 1 or 5). Schools must not forget that they exist to prepare the students, not only to find a job after graduation, but to live life and be a productive member of society and humanity.